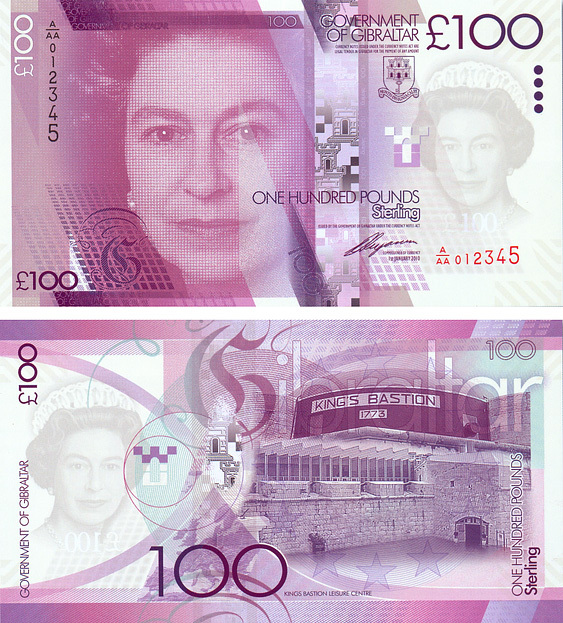 The £100 has a mauve colour scheme, with the image of Her Majesty Queen Elizabeth II on the front, and King's Bastion depicted on the reverse. The King's Bastion stands at the centre of the medieval seawall that protected the old City. It was fortified by General Boyd (who is buried in the Bastion) in 1773 in time for it to play a key role in the defence of Gibraltar during the Great Siege. Gibraltar's first electricity generating plant was sited in the courtyard of the Bastion. The Generating Station was demolished to give way to today's leisure centre, a stunning innovative use for a historical military fortification.